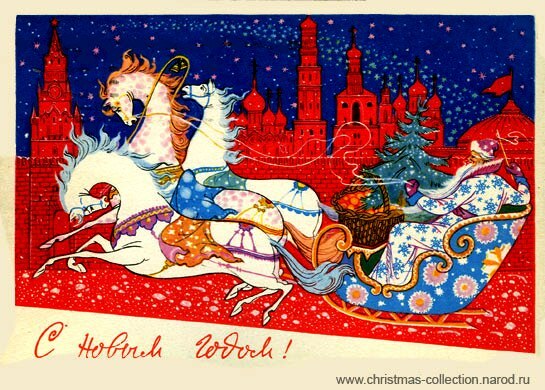 The New Year is the biggest holiday in Russia and is celebrated on a level equivalent to our Christmas. They do have Christmas in the Orthdox religion, Рождество, which takes place on January 6, but in the Orthodox religion they believe the the resurection is the event to celebrate, so Easter, Пасха, is the most celebrated religious holiday. So if you wish a Russian “Merry Christmas” and they don’t know what you are talking about this is why. The New Year, however comes with all the same enchantments as our Christmas. To celebrate the New Year Russians find a Christmas tree, Елочка, and children await the presents to be brought to them by Santa Claus, Дед мороз, and there is all the same hype for the New Year as there is for our Christmas. Can often be seen wearing the same red coat as his Western counterpart, and just as often appears in blue, which is considered one of the primary colors of the holiday. The Troika, Тройка, a sleigh with three(troi) horses, can be found all over in Russian literature and it holds a very tender place in many Russian’s hearts. 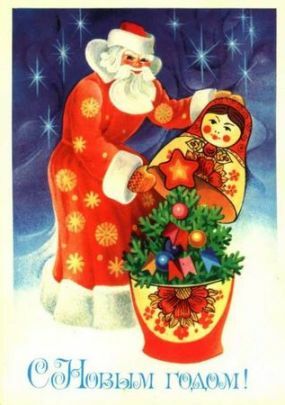 Father Frost greets the astronaut with a Karavai, Каравай, or the bread and salt that is traditionally offered at celebrations. I haven’t quite figured out what this has to do with the New Year, but I think it has to do with hopes of luck and success and a minimum of labor. A wish that in the New Year, may you, like Emelya, have every success and happiness, ability to get out of trouble and avoid punishment for your reckless behavior, may you have a princess fall madly in love with you, and most importantly, may you never have to leave the comforts of your warm fireplace to obtain these things. This is the Russian’s ideal year! По щучьему веленью, по моему хотенье, да будет успех и счастье в 2008ом году! Wow! You’re using the same collection that I have been mining for my posts. Aren’t they ADORABLE? I have been so BUSY with the preparations for the feast. Tonight, we have gone to Christmas services at the monastery at Jordanville, and all the kids are waiting for Dede and Snegurochka to bring their gifts. Sorry for the silence. I had so MUCH to do! Look at my site tomorrow, and you’ll see your name in my Christmas greetings! s Rozhdestvom Khrystovym, sladkiye moya! Where do you find all these images?! 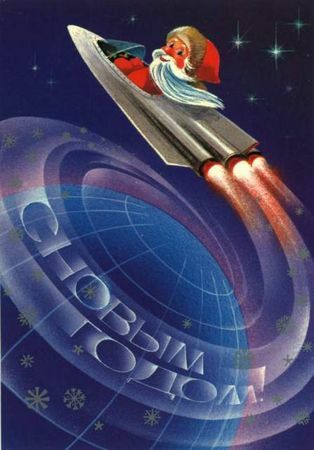 I love the soviet postcards; I’ve never seen them before. Good job on the blog, I’ll have to frequent more frequently.